This Tibetan monastery has survived multiple attacks and is home to one of the world's last sky burial sites. Tibetan monasteries with their peaceful and silent atmospheres might seem unlikely candidates for violence and politics, but the Drigung Thil monastery near Lhasa suffered great destruction early in its history before being rebuilt to become the structure seen today. China's very own Atlantis is an ornate dynastic city resting at the bottom of a lake. Thanks to the building of a life-giving reservoir, part of the Great Wall of China is now a dive site. The fortress-like monastery, also called Drikung, was founded by Kyowa Jigten Sumgon in the late 12th century, and his Drigung Kagyu school of teachings soon acquired a huge following. With its increasing popularity and political power came a rivalry with another influential sect, the Sakyas. The Sakyas eventually led a march on the monastery in 1290 and destroyed it. Though its political clout declined, the monastery was rebuilt and is today an important spiritual center, especially known for its meditation techniques. During the Cultural Revolution, the monastery suffered another series of attacks, with many of its statues and manuscripts looted and buildings damaged. The current site overlooks the Shorong valley and contains traditionally decorated temples, prayer halls, and residences for around 250 monks. 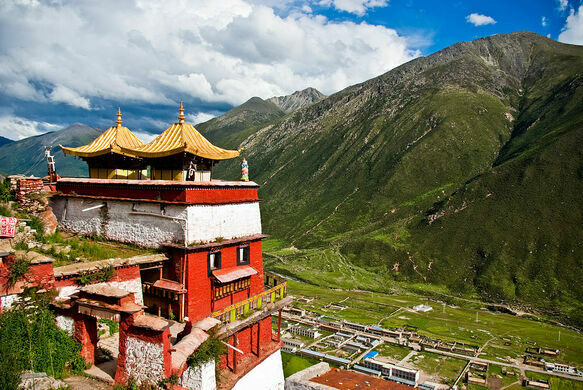 The monastery is also well-known for its sky burial site, situated at a height of 14,975 feet on the mountaintop. The death ceremonies are performed by the monks every afternoon, and the following morning the bodies are carried to the lofty site, which is surrounded by small stupas and temples. Himalayan vultures are invited to feed on the flesh, and anything that remains is burnt and offered to the sky in another ritual. It is one of the last remaining places in the world where the traditional excarnation ritual is practiced. Described as "the world's most blinging pool." The tallest unclimbed mountain in the world remains poorly charted out of respect for local spirits. This Bhutanese site is one of eight sacred locales established by a revered 14th-century Buddhist master. According to legend, this temple was built to pin down the body of a demoness who lay across the Himalayas.